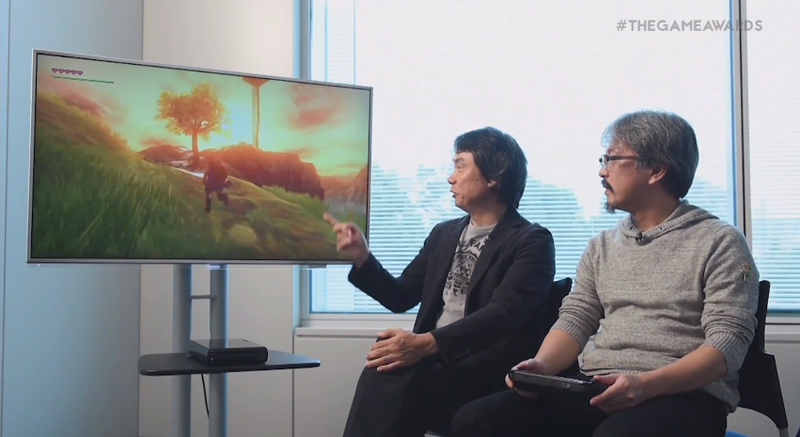 Here's a nice surprise: Nintendo's top developers playing their huge new open-world 2015 Zelda game. Marvelous! Nintendo just showed off that new Zelda at The Game Awards via a video recorded at the company's studios in Japan. Zelda lead producer Eiji Aonuma controlled the game while original Zelda creator Shigeru Miyamoto added some commentary. The game shows a zoomable world map on the Wii U gamepad and action on the TV. The map indicates that the game's world is huge. At one point, Aonuma said that it'd take five minutes to span the distance that they wanted to travel, from one part of the game's map to another. (it seemed that they were operating in the map's lower right corner.) This led Miyamoto to quip about whether the game would actually come out next year. It will, Aonuma said. It might take five minutes to get from the green arrow to the red X, though that wasn't completely clear due to how the video was edited. The Nintendo devs seemed to have made some progress in their journey before making the time estimate. So it could take longer? Link has a sailcloth in the game, a sort of gliding parachute device seen in Skyward Sword and kind of like the leaf in Wind Waker. He can also set waypoints from a first-person mode. Go first-person, spot an area of interest, mark the waypoint and then go to it. The idea, it seems, is that anything you can see in this game world, no matter how far out in the distance, is a location you can reach. Link can get around quickly by riding his horse, Epona, who apparently won't run into trees. Epona appears to automatically avoid trees as you gallop through. You can shoot arrows and swing swords from Epona. Link can also jump off his horse and attack enemies in slow-motion as he does an aerial dismount. Nothing that the Nintendo developers showed was all that surprising, but it's still the first time we've seen the game being controlled by anyone. It looks massive and visually striking. Presumably, we'll see a lot more of it by E3 of 2015. Miyamoto also confirmed that his new Wii U Star Fox game will be out next year, some time before this new Zelda.